Time to sell your Seaspray condo? Read about today's resort-market buyer. 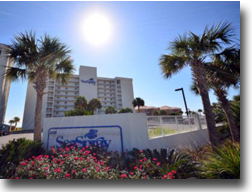 Seaspray condos are located in the middle of the island of Perdido Key, Florida. The condos actually sit directly on the Gulf of Mexico, but have boat facilities across the street on Old River, including a boat ramp and slips. Some of the features of Seaspray include covered entry, a fishing pier, exercise room, outdoor pool, a tennis/racquetball area, and boat trailer storage. Seaspray condominium is comprised 154 Gulf-front condos built in 1984. Seaspray floor plans range from 1,239 two-bedroom units to 1,650 square foot three-bedroom units. Visit our Perdido Key Condos for Sale page to find similar condominiums such as The Mariner, Perdido Towers, Windward, and Shipwatch. Please let us know if you would like further info for Seaspray or any other Perdido Key FL condos, homes, or real estate along the Gulf Coast or would like to schedule a private viewing by emailing info@condoinvestment.com or by calling (251) Area-Pro (251-273-2776) for immediate assistance. RENTAL TIPS to increase your Seaspray rental revenue.